Covering your T-Top boat is an easy, one person operation, whether you’re on a lift, dry stack, or trailer. Our lightweight covers are uniquely designed to be installed from within the boat using adjustable webbing straps and plastic side release buckles. This allows for easy positioning of the straps and a secure fit. When you install your custom T-Top Boat Cover, you will notice that it does not cover the roof of the T-Top. That is because the covers are specifically designed to hang 6” to 8” under the T-top. This allows water or moisture to evaporate and exit the boat. Air is allowed to enter around the motor(s), circulate around the console and vent out just under the T-top. This will help prevent mold or mildew from growing on your boat. 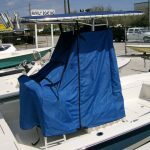 The trailerable Universal T-Top Console Cover is secured to the underside of the fixed T-Top structure and will enclose any size console, helm seat and T-Top support combination with a maximum base perimeter, (at the deck), of 18 feet or less. 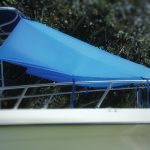 Installation of your T-Top Bow Shade is quick and easy, so you can enjoy your time on the water sooner, and longer. You do not even need any tools to install it. Please remember that T-Top Bow Shades were not designed to be used underway and cannot be used for that purpose.